It’s actually a fun tool that your students from all levels can use to improve their writing skills as they are creating their own stories in a unique way. 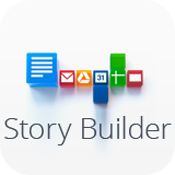 Google Story Builder doesn’t ask you to have an account, you simply start writing the names of the characters in your story and writing what they are saying or editing lines of dialogues in a word document style. When you are done, write the title and choose your music. You can watch and listen your story and share it with others. You can use this tool with whole class to write a story together. Use the characters in a story that you have just read to write the dialogue between them. Use famous characters as you create your story. Teachers can create their own stories and ask students some questions about it. An easy and fun tool to give it a try.